Imagine a video game that includes 33 Batmans (Batmen? ), 130 Green Lanterns and even Aztek The Ultimate Man. Imagine a game that, its creators say, includes ever super-powered hero or villain in DC Comics’ nearly 80-year history. That game is real. It's scheduled for a fall release. 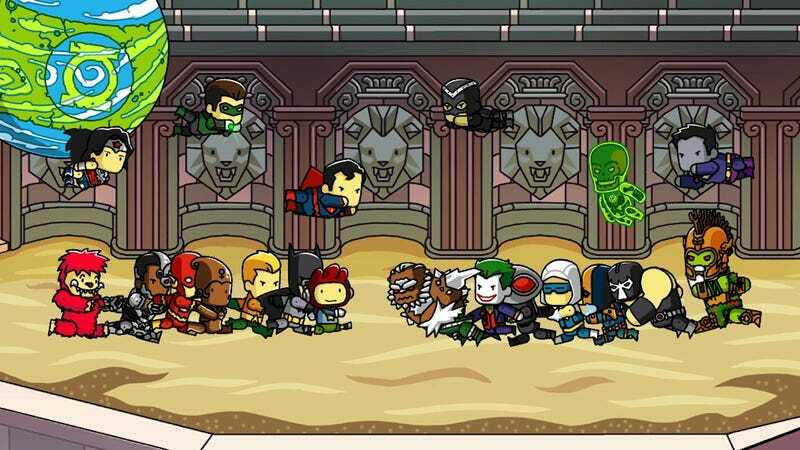 The game goes by the name Scribblenauts Unmasked: A DC Comics Adventure. It’s a PC, 3DS and Wii U adventure. It's a spin-off to the popular Scribblenauts series that invites you to write anything you can think of and have it appear in the game. It’s funny. Back in 2009, when I first heard about the concept of the original Scribblenauts I had a hard time believing that players could write any noun that refers to an object into the game and it would show up. I tried to stump the game, but I never succeeded. It didn't know proper nouns; but it knew other words for a thing or type of person. Now, for some reason, I’m having as tough a time believing that there can be a game with every DC Comics hero and villain ever. Surely they missed one? “We have the DC Comics characters… all of them,” Caleb Arseneaux, producer at the game studio 5TH Cell said while introducing the game to the press this week in Los Angeles. Yes, of course: they’ve got Superman, Batman, Wonder Woman, Green Lantern, Aquaman, the Flash and Cyborg. While Arseneaux presented the game to a group of reporters, he had the game idling behind him. On a large TV screen we could see hundreds of DC characters in the Scribblenauts art style. I spotted Bulleteer. Ambush Bug. B’wana Beast. I saw Bloodwynd, for Granny Goodness’ sake! (I read a lot of DC Comics growing up). At some point, someone asked for Mogo. The person driving the game while Arseneaux talked typed in “Mogo”. A planet-sized Green Lantern appeared on the screen and promptly beat up Forager. I couldn’t even believe I remembered who Forager was. As before, anything that you conjure that is animate will have some brains and start to interact with others—so assume that any summoned hero or villain, including "zombie Batman," may immediately start a brawl. The DC characters also have powers, and all of this can be mixed up and customized in an editor that lets you concoct your own heroes or villains. By the way, they confirmed that they have G’Nort, the dog Green Lantern. I do wish I asked if they had the Brotherhood of Dada, specifically, The Quiz, who has every super-power you haven’t thought of yet (Read Grant Morrison’s Doom Patrol run, people!). About the game… players control Scribblenauts hero Maxwell, who apparently is a big Batman fan. His sister Lilly joins him in this game. She digs Superman. Somehow they get pulled into the DC Comics universe and begin to travel to iconic DC locales such as the Batcave and the Green Lantern planet of Oa. Heroes and villains will pop up in these places, as will Heroic Feats. The Feats are little quests/puzzles that are generated on the fly by the game, combining a bunch of variables crafted by the game’s developers. A Feat might involve having to remove smog from Gotham City (build a fan? ), battle Sinestro on Oa (summon Red Lantern Guy Gardner?). We weren’t shown much of the feats, but that’s supposedly the bulk of the gameplay. There are also story missions. We’ll see more of that in the coming months. Note: there are a lot of Flashes in this game. Were you wondering, though, if the game includes Matter-Eater Lad? I was. Arseneaux wasn’t sure. A request was placed. A day later, I was sent this art for the game. Here is one piece of it: Scribblenauts: Unmasked’s version of Matter-Eater Lad. I also asked about Brother Power, The Geek. They obliged. Arseneaux said that 5TH Cell mined the DC Comics Encyclopedia for characters. He thinks they've got them all and says they have some 2,000. Could that really be everyone? He did tell another reporter that there would be no Watchmen, since the focus is on DC’s main publishing universe. Microwave Mom. I did not expect that!